Technology in the 21st century: What has it done to our society? Since the day of its creation, there has been one thing in our lives that has changed the way we communicate more than any other. It’s the one thing that has made us less social, more depressed and all-out addicted. No, we’re not talking about John Mayer. We’re talking about the Internet. College students and the Internet have a complicated, clingy relationship. 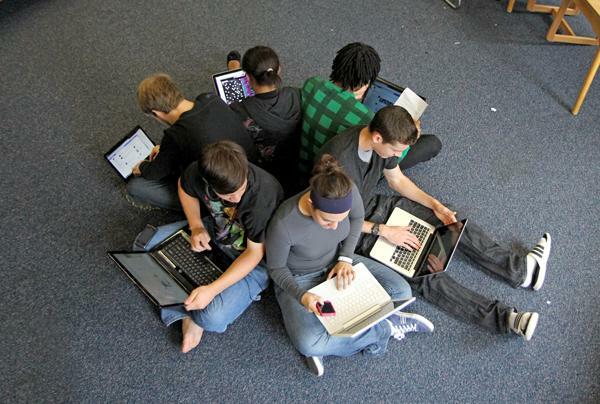 These days students spend more time on laptops and smartphones than ever before. In fact, a study at Bryant College indicates that for 65 percent of college students, Internet use is pathological. We don’t need proof in numbers to realize we’re all hooked on Wi-Fi though. How many times a day do you feel your phone vibrating when it really isn’t? How many times a day do you open Facebook on your MacBook without even realizing it? Internet use is much more than a trend — it’s an addiction. Many students would agree the Internet is becoming almost drug-like. Why has technology dependence become so serious? For one thing, the Internet hasn’t offered another form of communication; it’s replaced other forms of communication. Today, college students use social networking sites to communicate with friends rather than have conversations in person. A lot of students feel they are more social online than they are in real life. Facebook has made friendship streamlined and convenient. You can communicate with friends and family without moving or going outside. But while keeping in touch is easier, have we lost something in the process? It seems that friendships just aren’t as personal as they once were. Instead of spending more time with someone, a simple family request validates closeness just as well. This shift to a more visual, less real social life may be convenient, but if we live in a society where convenience always comes first, something’s wrong. In reality, when students are socializing in person, a phone or laptop is always close by. Access to your alternate reality is always looming. Not only has technology changed the social aspect of the college experience, but also those rare moments of solitude. With your friends always at your fingertips, it has made confidence less of a necessity. The notion of a solitary walk from your dorm room to Lecture Hall no longer exists. Looking someone in the eye and actually connecting with them requires effort. Walking with your head down and your thumbs beating the keys on your cell phone signifies your security. Back in the day, students may have meandered through the Fine Arts section of the library to pick up a book. They may have even sat and spent some quality time alone without any distractions. There was a time when spending time reflecting and getting to know yourself did not involve vibrating interruptions every two seconds. In 2011, this has been replaced by Wikipedia and tweeting about Binghamton’s weather. In fact, those who spend their alone time attached to their computers tend to be more depressed. Researchers at Leeds University in the United Kingdom have linked excessive Internet use to depression. “This study reinforces the public speculation that over-engaging in websites that serve to replace normal social function might be linked to psychological disorders like depression and addiction,” one scientist said. Being social in college means much less than it has in the past. Today, a typical night in includes three or four students sitting on beds talking to each other sporadically because they are all on their own personal laptops. When laptops are away, we’re all checking our phones or texting other people. We obviously don’t know exactly how college used to be, but it probably consisted of kids all sitting out on the quad on nice days and people playing board games or hooking up with each other in the dark. Is it just us whose parents talk about college like it was four years of social stimulation and bliss? The saddest part about the technology addiction is that those who rebel, those who decide against having a Facebook, are essentially committing social suicide. Without a Facebook in our world, without a set number of friends and photos of you at some frat with your friends, how will people even know you exist? How will you know others exist? The main reason why these sites are so addicting is because without them, we wouldn’t know what to do. We would be lost.